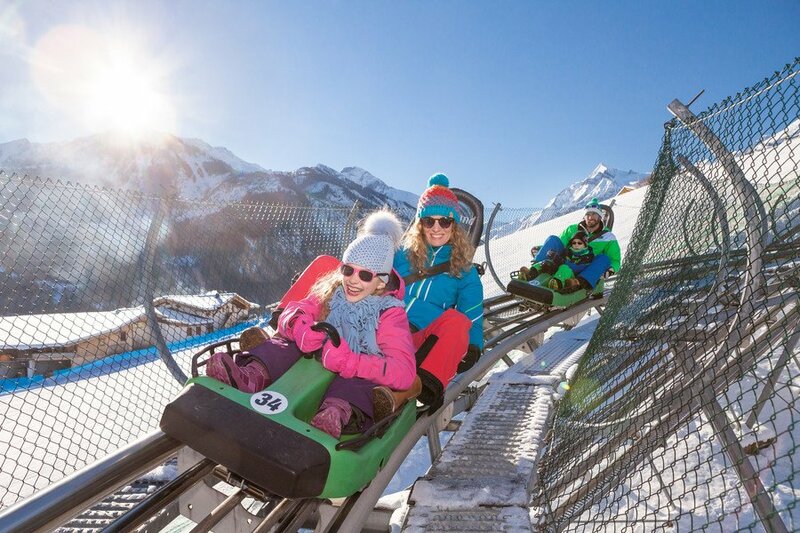 Tobogganing and toboggan runs in Zell am See-Kaprun. If you go on a family holiday, you must go tobogganing. There is no doubt about it: racing down the mountains of the Zell am See-Kaprun region on a toboggan is a cool thing for sure. This is not just fun for children. Tobogganing is a winter activity by nature. But not in Zell am See-Kaprun. Apart from many winter toboggan runs, we also have a year-round toboggan run. This is great fun for entire families, parents and children. Toboggan fun can be enjoyed at the Alpine Coaster and the Maisiflitzer all year round. You can experience the force of gravity on the Maisiflitzer throughout the year when elsewhere tobogganing is not on the agenda during the summer months. The Alpine Coaster - more a roller-coaster than a toboggan run - is located on the slopes of the Maiskogel in Kaprun. Start and finish of the run is the Schaufelberg car park. The Kaprun Family Leisure Park can also be found there. The lift takes you uphill to the start and then it's downhill into the valley across bridges, waves, through banked curves and tilted spins like on a rollercoaster. Whether rain or sunshine, cold in the winter or heat in the summer - the Maisiflitzer in Kaprun is always open. 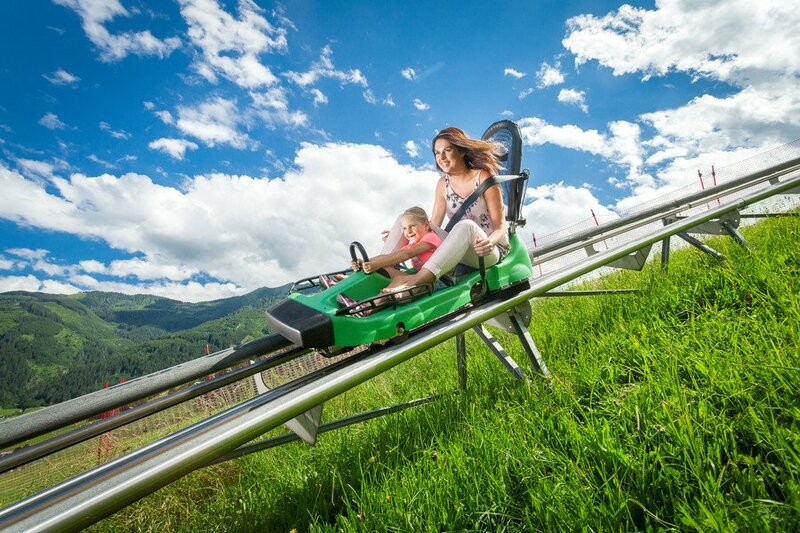 The summer toboggan run at the Biberg in Saalfelden welcomes guests exclusively in summer. With a length of 1.600 metres and 63 curves, this is great summer fun for the entire family. Tobogganing is clearly a winter sport. There is a great selection of fantastic and unforgettable toboggan runs during winter in and around the region. The 1.5 km long toboggan run from the Köhlergraben through the Schmittental to the Hotel Waldhof in Zell am See promises lots of fun. 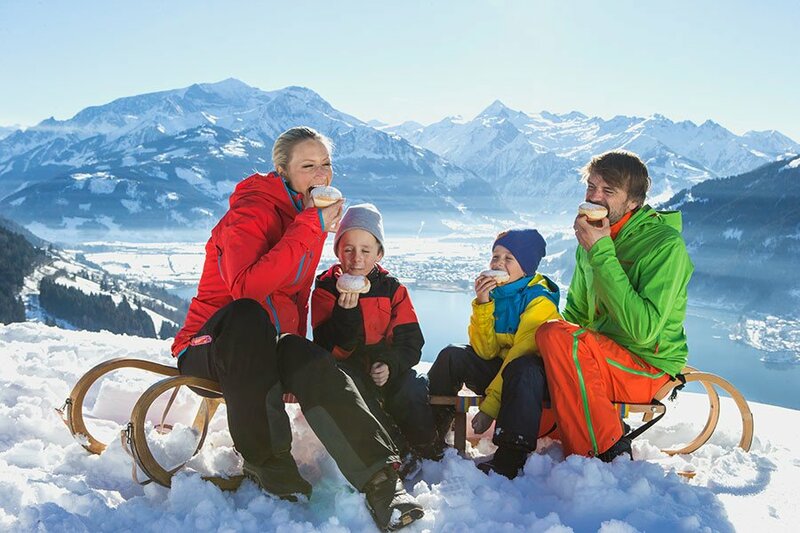 Daily tobogganing fun is guaranteed here until 10 p.m. and always on Tuesdays you can take the tobogganing bus to the Schmittenhöhe trassXpress and back again. In Kaprun, the toboggan run Guggenbichl, which is 2 km long and promises even longer tobogganing pleasure until 10 p.m.
Just around the corner, in Bruck at the Glocknerstraße, is the Berggasthof Kohlschnait. The lights of the toboggan run can be seen from afar. After a leisurely ascent by tractor and a warming stop at the inn, you race into the valley with speed and fun. The world's longest nighttime toboggan run is also just around the corner. Tobogganing action on 14 km is waiting for you in Bramberg at the Wildkogel. The Smaragdbahn takes you first to 2.100 m above sea level before you can enjoy toboggan fun downhill to Bramberg. Illuminated at night, the world's longest nighttime toboggan run can be seen from afar and is a trademark of the Wildkogelarena region. Toboggan enthusiasts better wear warm clothes as the 14 km-downhill ride will take some time but it is an unforgettable experience. 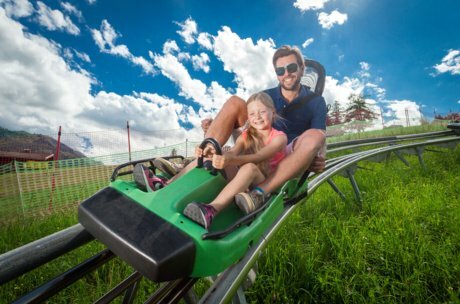 Whether Maisiflitzer, summer toboggan run or the world's longest nighttime toboggan run at the Wildkogel - tobogganing here is possible all year. Book your next summer or winter holiday in the Zell am See-Kaprun region now. In case of any questions, contact us directly!